Just the other day, Sprint's web site showed data tethering as a feature of the Palm Pre under the heading of Technical Specification. Now, there is no mention of tethering for this highly anticipated new smartphone. In its place is a blurb about the Pre's MicroUSB port. Removing any tethering capabilities from the Pre would seem to be a way for Sprint to sell their Simply Everything + Mobile Broadband plan. As we reported earlier this week, that plan now includes 5GB of internet access per month for a laptop. Even with the anticaption surrounding the Pre, this is a big enough disappointment to many smartphone fans that you can now hear a pin drop. Could not agree more. You thought the storm was bad? 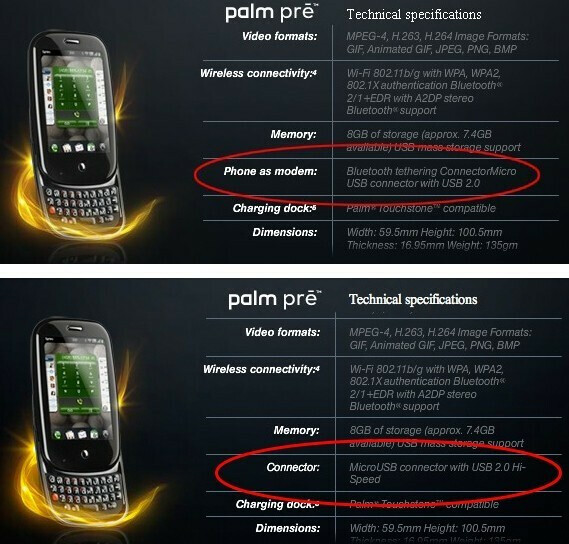 That was Rim, you honestly think Palm is gonna be any better? -The thing about these new High tech devices, it's not that they're bad ..they just get released before they're actually ready. They don't take enough time to work out all the bugs and stuff. Take the Storm for example.."great" device...but a little too buggy.